With almost any song you want available online with a click, it can be easy to dismiss music as nothing but a commodity. So, it’s good to see musicians innovating to create experiences that create a meaningful, memorable connection with their audiences. 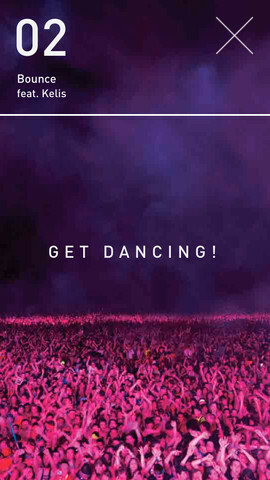 Case in point, the new app out today from Calvin Harris. To tie in with Harris’ new album 18 Months, developer We Make Awesome Sh has cooked up an app that allows you to listen to all the tracks in full, but with a twist – you have to keep moving to keep listening. Select a song from the album and it will begin playing, but if your phone stays still, it soon stops. Keep moving though, and the song will continue. The idea is to keep you dancing right through the album. Of course you could just keep shaking your phone, but that’s not as much fun, is it? As a bonus, if you take a photo of the album’s cover from within the app, image recognition will unlock remixes. The app is a clever marketing ploy – and simply just clever, too. While you could download the app and keep dancing to listen to the album as much as you want, there’s a link to buy a copy too. As much fun as it is to dance, you’d get some strange looks on the train, so buying music isn’t dead yet. 18 Months is a free app for iOS and Android and is available now.